…celebrating that it’s Friday. This week has lasted forever, or so it seems. …contemplating what to wear to the race. What sort of outfit will allow me to most effectively stalk my favorite drivers? I’m thinking some sort of casual sundress. …wondering when the pollen will be gone. My eyes are nasty and I’m tired of sneezing all the time. 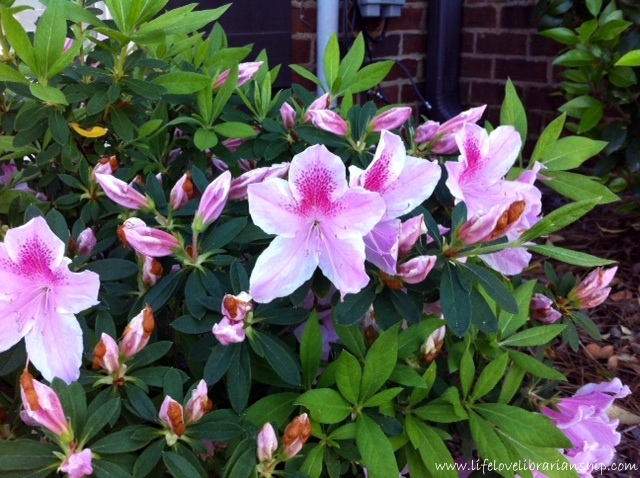 …loving these gorgeous flowers right outside my front windows. Despite the pollen, we are having a gorgeous spring! …eating a biscuit and drinking a diet coke. Breakfast of champions. …counting down the days until my mom and I fly out to Vegas to celebrate her birthday. 26 days! …still reading the same books I was reading last weekend. I got side tracked by Tessa Dare‘s latest, A Week To Be Wicked, which was a good book to be side tracked by. I am attempting to not be side tracked by JR Ward’s latest cracktastic book. 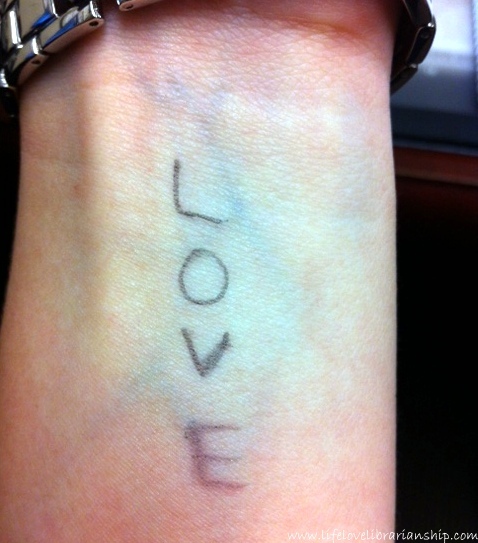 …writing LOVE on my arm because I am not alone and neither are you. Read why Megg is doing it too. …thinking that steamed shrimp with lots of cocktail sauce and a baked potato would make an excellent dinner. …loving all of you and wondering what you are up to today. Some people think it’s pointless to write love on your arm. I can’t think of anything more pointed. I was so scared to go to work with it today. Thanks for making me remember that I’m not alone. Hello Gorgeous. I’m testing your comments. 🙂 And also writing to say hi! Yours works. And your comments field looks different than mine. I wonder if it’s just my kind of comments?